"Life energy cultivation" is its literal translation. It is the alignment of breath, movement and meditation for exercise, healing and meditation. With roots in Chinese medicine, martial arts, and philosophy, Chi Gong, is traditionally viewed as a practice to cultivate and balance qi (chi) or what has been translated as "intrinsic life energy". Practice involves rhythmic breathing coordinated with slow stylized repetition of fluid movement, a calm mindful state, and visualization of guiding qi through the body. Is it for you? As we move into a period of heightened energy sensitivities, it will become more important for all healers and non-healers to improve their energy awareness and skills. 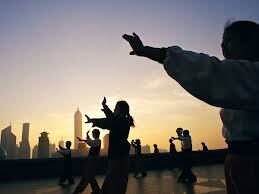 For this reason, 7 Stones is running regular Chi Gong programs.